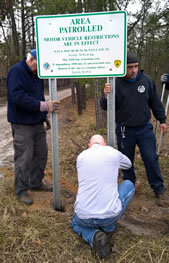 (16/30) TRENTON –Volunteers from various recreational user and environmental groups joined together today to post signs at entrances to Wharton State Forest as part of an enhanced effort by the Department of Environmental Protection’s State Park Service to enforce protection of natural resources from illegal off-road motorized vehicle use. The effort, taking place today and tomorrow, involves dozens of volunteers who have participated in a public outreach process spearheaded by the DEP to balance multiple recreational uses and protection of environmentally sensitive areas in the 125,000-acre state forest. The signs alert the public that the state forest’s vast network of unimproved roads is being actively patrolled by law enforcement and that anyone caught leaving these roads and damaging natural resources is subject to fines and potential impoundment of their vehicles. Volunteers, assisted by State Park Service personnel, are helping to erect the signs in a symbolic gesture demonstrating that Wharton’s resources can be protected through cooperation while supporting a wide variety of activities, including hiking, canoeing, bicycling, horseback riding and recreational motorized use, said DEP Commissioner Bob Martin. 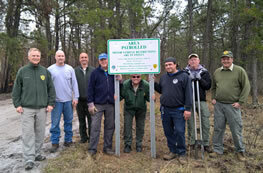 Taking part in the sign-posting effort are members of the Pinelands Preservation Alliance, Jeep Jamboree USA, the Jersey Off-Road Bicycle Association, the Outdoor Club of South Jersey, South Jersey Geocaching and Open Trails New Jersey. Violations can carry a fine starting at $250, plus costs to restore damaged natural resources. Vehicles may also be impounded, which could increase overall motor vehicle violation costs to more than $900. Since Feb. 20, State Park Police have issued more than 100 citations under motor vehicle code and State Park Service rules for illegal off-roading and ATV use at Wharton. Commissioner Martin stressed that the DEP is working cooperatively with state, county and local law enforcement to ensure clear and consistent enforcement of statutes that prohibit the destruction of environmentally sensitive areas and require proper registration and enforcement of all motor vehicle regulations. In all, 65 signs are being placed at various entrances to the state forest, many of which are sand, dirt or gravel roads that plunge deep into pine forests and take visitors to secluded streams and rivers, cedar swamps, and sites of long-gone settlements. As part of the DEP’s comprehensive enforcement effort, a special unit of the State Park Police has been formed to focus on preventing illegal off-roading in Wharton. This unit, in cooperation with other law enforcement agencies will be conducting enforcement “sweeps” in the near future. Environmentally sensitive areas that have experienced significant damage are also being posted with signs as being off-limits to motorized vehicles. The State Park Service will also continue to work to repair and improve roads that have become deeply rutted by misuse of off-road vehicles, causing vehicles to get stuck and creating significant access problems for first responders, including New Jersey Forest Fire Service personnel. Sprawling over much of Burlington County and parts of Camden and Atlantic counties, Wharton State Forest provides habitat to some 300 bird species, nearly 60 reptile and amphibian species and some 850 species of plants, including wild orchids, sedges, grasses and insect-eating plants, some unique to New Jersey’s Pinelands. The extensive network of unimproved roads in Wharton State Forest was built primarily in the 18th and 19th centuries to connect villages which supported a variety of industries, including ironmaking, glassmaking, timber and agriculture. The State Forest is visited by some 700,000 people annually. For more information on Wharton State Forest, as well as summaries of stakeholder sessions, visit: http://www.state.nj.us/dep/parksandforests/parks/wharton.html.